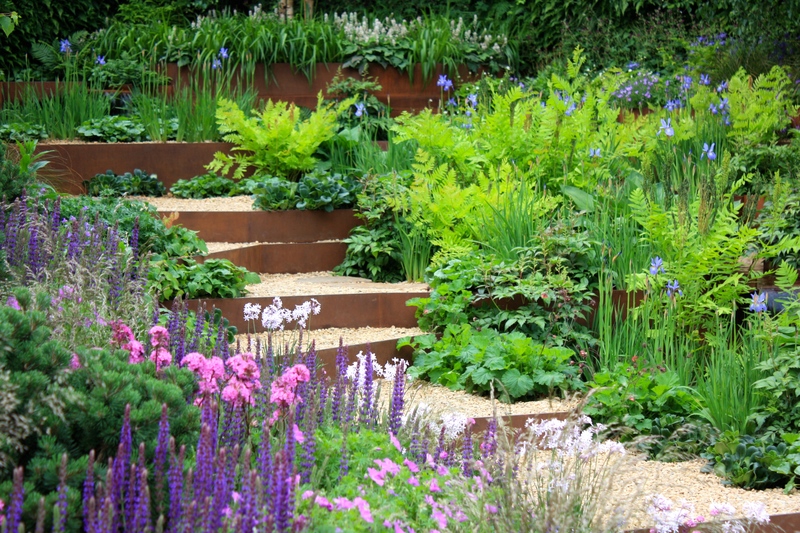 Over the years the rock bank site at Chelsea has provided the setting for some of the show’s most exciting gardens. Last year it was occupied by The Australian Garden created by Flemings for Trailfinders, a stunning garden that will linger long in the memory and which marked their end of their eight year long association with the show. Curiously for such a prominent location the rock bank has been carved in two this year, one half occupied by the kind of water features that mercifully most of us are unable to afford, the other by Patrick Collins’ design for charity First Touch. Being gently elevated towards the back, the plot offers its designer opportunities that Main Avenue does not. 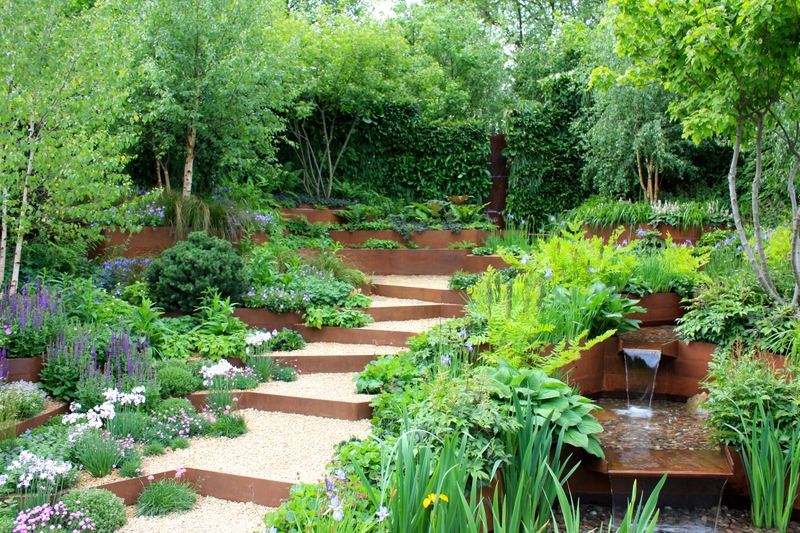 Philip has taken full advantage with a scheme composed of intricate terracing and falling water. Like The Telegraph Garden, which receives my ‘Best in Show’ accolade, Patrick eschewed prairie-esque planting and limpid pools for a design which I felt had genuine stand-out. The garden is a celebration of the amazing work carried out by the neonatal unit at St George’s Hospital in Tooting, London, which cares for some of the sickest and most premature babies born in the South East. Patrick’s own daughter, Isabel, now 13, was born at 27 weeks and spent the first three months of her life in St George’s, so his commitment to this garden is a very personal one. First Touch is a charity which supports the hospital, raising money for vital equipment, specialist nurses and support for the families of sick babies. They have their own WordPress blog where you can find out more. 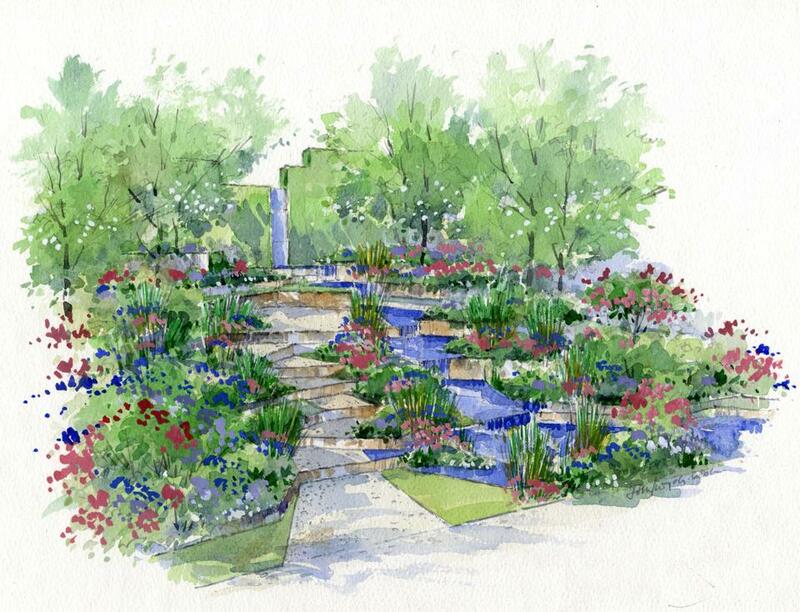 Patrick’s design for the First Touch garden is symbolic of the strength and determination shown by premature babies and their families on their journeys, which can be long, distressing and painful. 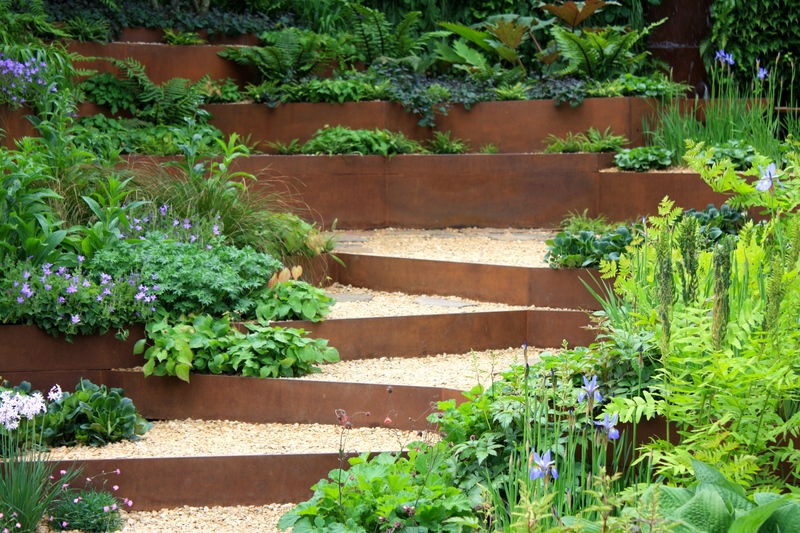 The garden has two central features, the first an asymmetric flight of steps crafted from rust-coated steel (a finish repeated in several show gardens this year) and buff-coloured gravel. This is a lovely contrast, the sharp angles of the chestnut metal against the lightness of the stone. The tone of both materials is cleverly echoed in the papery bark of Chinese red birch, Betula albosinensis, its new foliage fluttering cool and luminous above the terraces. Without this dramatic juxtaposition the garden might have been dense and heavy, but both gravel and water reflect light pleasingly into all corners of the scheme. 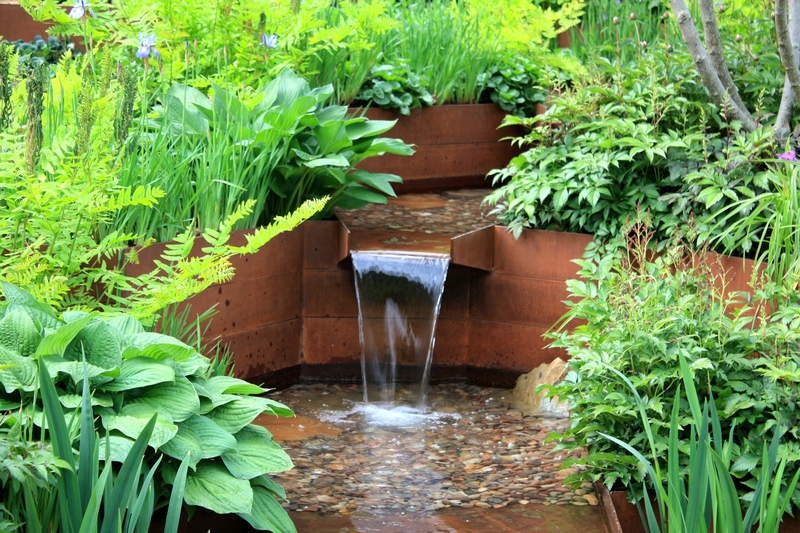 A second key feature, the watercourse, starts its journey in the form of a narrow, dramatic waterfall almost hidden amongst foliage at the back of the plot. It makes its way through a series of stepped pools and small cascades to the front of the garden. This is intended to symbolise the difficult time families experience when a baby is born prematurely, followed by greater calm as the journey (hopefully a positive one) unfolds. The water’s course ends in a slightly larger pool where a pale, abstract sculpture in loosely human form marks the centre. The plants that tumble down the banks of the stream could have come from my own garden – a typical waterside combination of astilbes, Hosta fortunei var. hyacinthina, ferns, irises, Tradescantia ‘Purwell Giant’ and Primula pulverulenta. Patrick’s contemporary use of these plants was a nice reminder of the country’s great stream-side gardens, such as those at Trengwainton, Cornwall and Harlow Carr, Yorkshire. The other side of the terraced steps was devoted to lovers of drier, sunnier conditions such as thyme, Alchemilla mollis, Nepeta x fraassenii, Tulbaghia violacea, Armeria maritima and Erodium × variabile ‘Roseum’. Against the cool greens at the stream side, the sharp blues and candy pinks really popped. This was a show garden that many gardeners might glean inspiration from. Sloping sites, either at the front or back of a house, are not easy to resolve. This treatment could be a great solution for a partly shaded situation, perhaps with the inclusion of a more extensive level space for entertaining and sitting out. 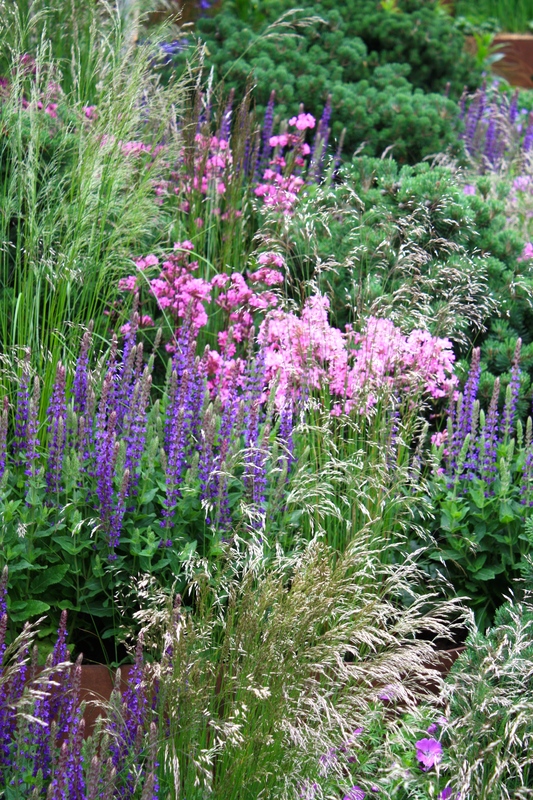 If I had any criticism it would be that very little information about the garden and the idea behind it is given in the accompanying brochure, and that the plant list misses out several key plants, such as the astilbes, irises, dwarf pines and regal fern (Osmunda regalis). This oversight won’t have spoilt anyone’s appreciation of this charming garden, which gets my runner up award for Best in Show and my vote for People’s Choice. Thank you very much for this proper look at this lovely garden. I haven’ t been able to get to Chelsea this year and the TV coverage is really annoying- too much chat and not enough lingering looks at the gardens. I have really enjoyed this and the good look at the Daily Telegraph garden. Please show us Cleve’ s garden too. Wonderful, insightful post. Sadly, couldn’t get to Chelsea this year so very much enjoyed your perspective.